The role of lobbying in the EU legislative process has been the subject of numerous studies, but to what extent do party political lines affect the nature of the relationship between interest groups and parties in the European Parliament? As Jan Beyers, Iskander De Bruycker and Inger Baller write, there is generally an expectation that business groups are more likely to align with right-wing parties, whereas NGOs campaigning for broader societal goals will more frequently align with parties on the left of the political spectrum. By analysing the context of EU legislative lobbying in relation to 54 legislative acts they demonstrate that this expectation largely holds true, particularly for the most controversial pieces of legislation. Almost intuitively we associate lobbying on behalf of business interests with right-wing politics, whereas we associate left-wing politics with NGOs advocating on behalf of a broader societal cause. However, most political science research focuses on either interest groups or parties. This bifurcation makes it difficult to assess how lobbying corresponds with party politics (and vice versa). Our empirical analysis of this relationship in the context of concrete European legislative processes demonstrates that this commonsensical relationship generally holds true for the more controversial legislative cases. This means that indeed the alignment of parties and interest groups is not something ad hoc, but there is a recurring pattern of shared and opposing preferences among specific parties and interest groups. Deviations from this pattern are to be situated within the set of cases for which we could not compare interest and party groups, for instance because no or little lobbying took place. Also legislative cases where parties are internally divided or where NGOs align with some business interests do not fit into this picture. Party political cleavages structure how we think and talk about politics. Nevertheless, interest group scholars have generally ignored how party cleavages are reflected in the world of interest group politics. For instance, EU interest group scholars usually focus on the interactions between government agencies and interest groups, as if EU-lobbying takes place in a non-politicised context. Such an approach might be justifiable if one assumes that the EU is characterised by the absence of party-interest group allegiances and elusive political controversies. However, thinking about the increased levels of politicisation of EU policymaking and the growing relevance of party politics in the European Parliament; it is plausible that systemic controversies at the level of political parties are also reflected in the realm of EU interest group politics. Public statement making in a nuanced media debate? We have mapped the alignments between EU-level parties and interest groups on the basis of the positions they articulated in statements reported in EU-wide media outlets between 2008 and 2010. The data was collected as part of the INTEREURO-project. One major advantage is that media-sources allow us to rely on one single data source for both MEPs and interest group officials. This differs from previous research where either MEPs or interest groups were surveyed – for instance, through consultation documents, votes or political statements in the EP – and indirect inferences were made about other actor types. Instead, we analyse MEPs and interest groups on the basis of one single data source with public statements related to the same legislative processes. Even though we looked into 125 legislative proposals, we only found public statements by both one interest group and at least one party group for 54 proposals. This indicates that not even half of the sampled legislative proposals were salient enough to generate a lively media-debate with multiple actors involved. As a result, much of our evidence points at two distinct worlds of EU lobbying: one in which the lobbying battles are fought very publicly over a small set of controversial issues and another world in which lobbying mostly takes place behind the scenes. When looking at general percentages, party groups and interest groups seem to adopt different positions towards legislative proposals: 67 per cent of the party-interest group combinations did not align. 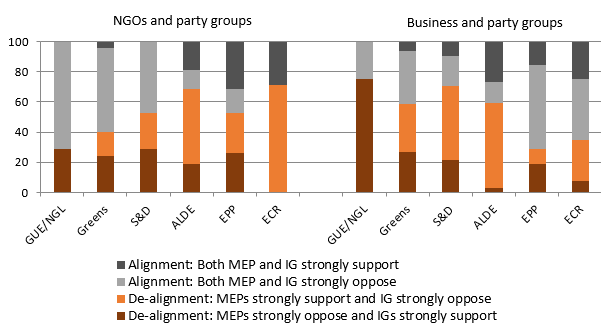 However, this is a bit misleading because MEPs tend to adopt moderate policy positions, while interest groups are more likely to adopt an outspoken position (e.g. trying to block a piece of legislation). To figure out whether NGOs align better with left-wing parties and business interests with right-wing parties, we plotted shared and opposing positions, as shown in the chart below. The left side of the chart shows shared support for the legislative proposal (dark grey), shared opposition (light grey), differing positions with the party group supporting the legislative proposal (orange) and differing positions with the party group opposing the legislative proposal (brown) for NGOs per EP party group. This side of the chart indeed shows that NGOs align better with left-wing party groups, since we can see a decreasing amount of grey as we move from left to right in this side of the chart. Within the shared position (grey), we can also see that the position changes from shared opposition (light grey) on the left towards shared support of the proposal (dark grey) on the right, which can be due to the more right-wing outlook of the European Commission in 2008-2010. The right hand side shows that for business interests the relationship, as expected, seems to run the other way around. From left to right we see an increasing amount of grey, indicating that business aligns better with right-wing party groups and especially with the Christian-democratic EPP. This pattern might be very much dependent on the policy context of the legislative proposal. Therefore, while checking the statistical robustness of the descriptive results in the chart, we analysed the impact of the political colour of the Commissioner in charge of the legislative proposal, the formal legislative procedure followed and the effect of the NGO- and business-‘friendliness’ of the DG that drafted the proposal. The political affiliation of the Commissioner and the legislative procedure did not have a significant effect on alignment patterns. However, we did observe that the ECR, ALDE and Greens are significantly more likely to share positions with interest organisations, when a proposal was drafted by a business-minded DG than by an NGO-minded DG. This leads us to conclude that the policy context, and particularly the DG that drafts a proposal, is relevant in understanding when and why interest groups and parties align. Our results show that both types of organisations – parties and interest groups – do not operate in entirely different worlds. Instead, the INTEREURO project demonstrates that the level of attention for EU legislative processes differs greatly and that the left-right cleavage amongst interest groups and parties was mostly articulated in cases that were more controversial and prominent in the news. Furthermore, the policy context surrounding specific policy issues matters, but future research will have to show how exactly. Jan Beyers is Professor of Political Science at the University of Antwerp and Director of the Antwerp Centre for Institutions and Multilevel Politics. He has published extensively in various prominent journals such as West European Politics, Journal of European Public Policy and European Union Politics. Iskander De Bruycker is a PhD candidate at the University of Antwerp and the Antwerp Centre for Institutions and Multilevel Politics. His research interests lie in the fields of political communication, European Union politics, interest group politics, public opinion and political parties. Inger Baller is a PhD candidate and teaching assistant at the University of Antwerp and the Antwerp Centre for Institutions and Multilevel Politics. Her research interests are representation in the European Parliament, legislative behaviour and the functioning of legislative institutions.